Beijing, April 15 (IANS) China on Monday said it won't hold a grudge against India if it skipped the second edition of the Belt and Road Initiative (BRI) forum, an event related to the multi-billion dollar connectivity project, to be held this month. Last month, Indian envoy to China Vikram Misri had said New Delhi could not be the part of any initiative that ignored its sovereignty and territorial integrity. He was referring to the China-Pakistan Economic Corridor (CPEC), the BRI's crown jewel. "Whether the Indian side will participate in the BRI forum, I think you need to ask India for more specific answer. 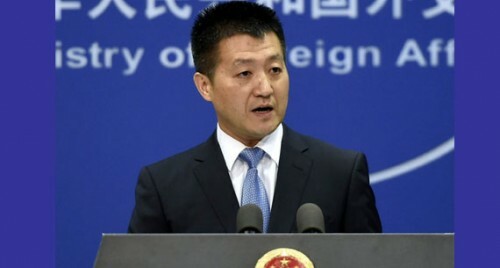 I would like to re-emphasise that the BRI is proposed by China, but it's already an international public good," Chinese Foreign Ministry spokesperson Lu Kang said. "As for the Indian comment on not participating in the BRI for various reasons, I would like to say the BRI is an open and inclusive economic cooperation initiative and does not involve territorial and maritime dispute," Lu said referring to Misri's remark. "The first BRI forum was a success and many practical outcomes were achieved and now more international organisations and countries are participating in the Belt and Road cooperation. I think it speaks volumes. "Since it's announcement, the Belt and Road cooperation has been an open and inclusive for all countries and organisation interested in it. But if the relevant side would like to wait and see, we do not oppose that," Lu said. India's absence will be conspicuous as China will showcase growing support for the project at the event, which will be attended by over 100 international organisations and countries. Despite India's protest, China has gone ahead with the project. However, it continues to seek India's concerns, saying the project is purely an economic one and has nothing to do with Kashmir. "In the BRI, China and other countries uphold the principles of equality and transparency. We follow market-based principles and the customary international rules. I think some sides have misunderstandings on the BRI and thus have some wrong judgment," Lu said. Asked if it meant India would miss the opportunity if it did not participate at the event, Lu said: "Some countries will lose some opportunities as more international organisations are participating at the event. you may need to ask the countries themselves which are not participating at the forum."